Info "I'm hungry for cookies! Put the cutter in the center of the dough and then press down. And don't mangle them either!" Cookie Rookie is one of Kat and Ana’s Microgames in WarioWare: Smooth Moves. 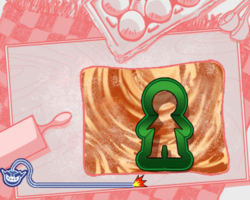 Using the Wii Remote, the player must carefully aim the cookie cutter over the sheet of dough to imprint the shape. If the aim is off and a part of the shape is cut off, the game ends in a loss. Some of the shapes may include a cross and gingerbread man. 1st level difficulty: The dough is large. 2nd level difficulty: The dough is smaller. 3rd level difficulty: The dough is fairly small. This page was last edited on February 19, 2018, at 18:02.